Open the scene for the worker type which you want to connect (UnityClient or UnityWorker). Find the Bootstrap component on the GameEntry game object. 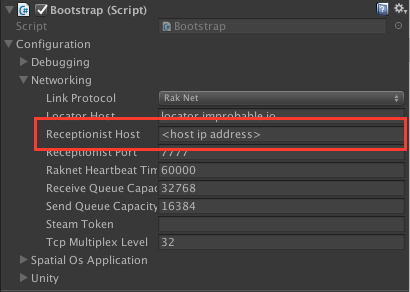 In Configuration -> Networking, change the Receptionist Host to the IP address of the host machine which you found earlier. This will override the IP address in the Bootstrap component when you launch using spatial local worker launch. Find your default Game Mode blueprint and open it. Change the Worker Id Override field in this blueprint to the host machine’s IP address. Make sure Use External Ip is set to true. 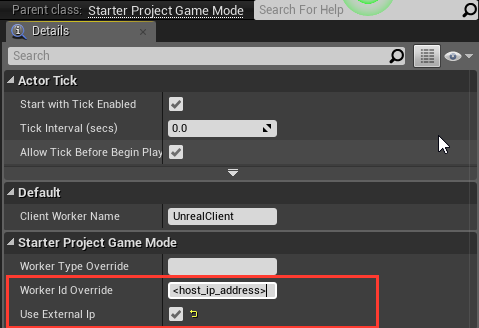 This will override the IP address in the Game Mode blueprint when you launch using spatial local worker launch. Now the workers are configured to connect to the host machine, you can launch workers on other machines that can connect to the deployment. These can be client workers, or workers that would usually be run as managed workers (for example, UnityWorkers or UnrealWorkers). You can run the workers as normal and they will connect to the host’s local deployment. For example, you can run the workers directly from the Unity or Unreal editors, or use spatial local worker launch.